The new BMW 3 Series sedan was launched today in four exclusive design schemes: Prestige, Sport Line, Luxury Line and M Sport. The new BMW 3 Series is locally produced at BMW Plant Chennai and can be ordered at BMW dealerships across India from today onwards. 40 years ago, the BMW 3 Series established the modern sports sedan segment and is the world’s most widely sold premium vehicle. With its sporty character, the BMW 3 Series epitomises the heart of the BMW brand more than any other model. The new BMW 3 Series will continue to lead this legacy with its sporty design, powerful performance and unmatched efficiency. With its everyday usability, dynamic characteristics and attractive design, the new BMW 3 Series will establish a new benchmark in the Indian luxury car segment. The BMW 360º program further provides exceptional flexibility and affordability to our discerning customers. The new BMW 3 Series exhibits versatility that makes it unique by offering customers a choice of vehicle that expresses who they are and conforms to their personal preferences and lifestyle. The new BMW 320d Sport Line celebrates the rush of adrenaline with sporty styling and interiors while Luxury Line indulges you to move in style with elegant contours and luxurious features. Customers have a choice to avail the new BMW 3 Series with the BMW 360º Program. Offered by all BMW dealers, this unique program enables prospects to select the new BMW 3 Series model of their choice, the tenure of financial contract and per annum mileage criterion. Basis the selection, an assured buyback ensuring low down payment, affordable monthly instalments, complimentary service and maintenance for three years can be availed. This provides the freedom to upgrade, retain or return the vehicle at the end of the tenure. The eye-catching design of the new BMW 3 Series instils it with a striking presence on the road. The distinctively sculpted long bonnet and set-back passenger compartment creates extremely dynamic proportions. The revised LED headlights and LED fog lights underline the sporting appearance to an excellent effect. The LED indicators highlight the hallmark BMW twin headlight arrangement and create a stylistic link between the headlight unit and the BMW kidney grille. The rear light are full LED units arranged in distinctive BMW ‘L’ shape and are heavily curved lending greater dynamic presence to the rear end of the car even when it is stationary. The broader side air intakes along with newly designed front and rear bumper with line elements express the broad stand on the road. The M Sport version in exclusive Estoril Blue metallic colour further reinforces the agile character of the new BMW 3 Series even more prominently. The new BMW 3 Series Sedan with Sport Line sets clear visual accents. Its striking design features in high-gloss black reinforce its sporty look. The boldly designed kidney grille slats in high-gloss black produce an especially athletic effect for the front end. On the inside, contrasts between black and red express the typical BMW athleticism: red contrast rings on the round gauges of the instrument panel, including sporting chrono scaling, red contrast stitching on the sports steering wheel and a basic decorative trim strip in high-gloss black with coral red accentuated strip. Additional upholstery options are also available with Sport Line. As a distinctive feature of the Sport Line, the vehicle key is designed in black with a red decorative strip. 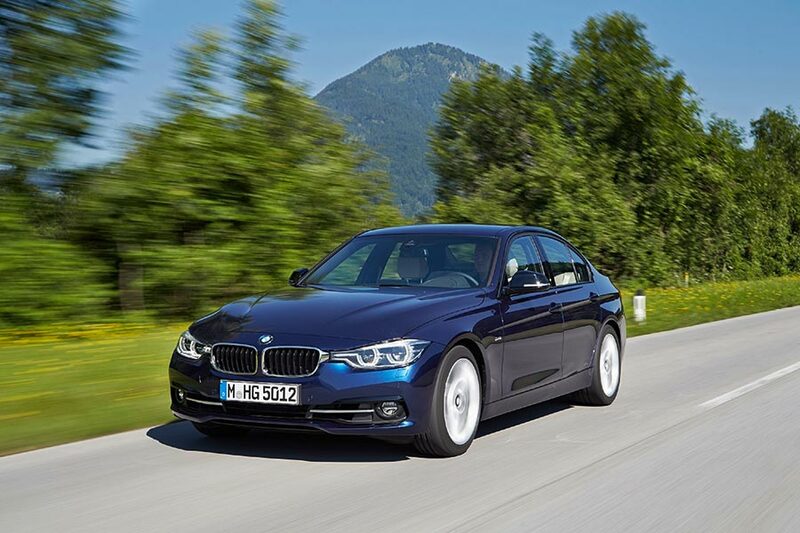 The new BMW 3 Series Sedan with Luxury Line impresses with its classic and elegant design. Discreet and refined design elements made of high-gloss chrome unit bring exclusivity to the exterior and are characteristic of the individual features of the line. As a distinctive feature of the Luxury Line, the vehicle key is designed in black with a chrome-plated decorative strip. 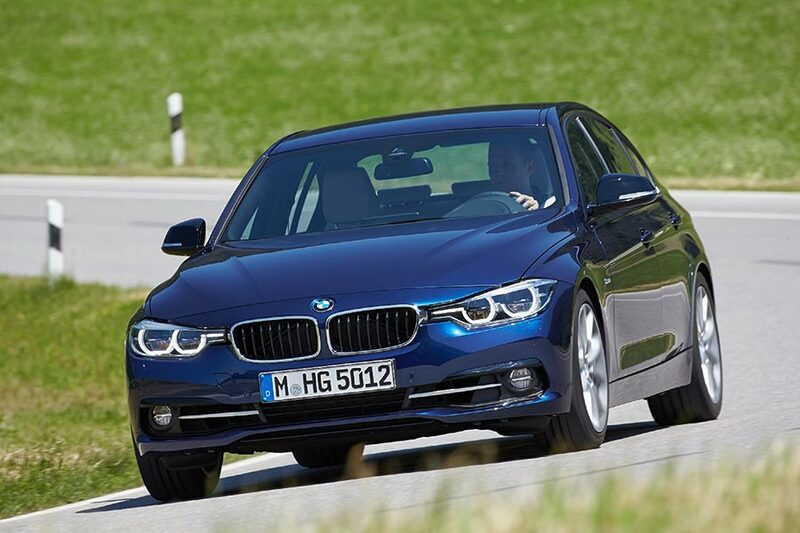 The M Sport version elevates the look and feel of the new BMW 3 series to the next level. The new BMW 3 Series M Sport is equipped with the M aerodynamic package, an M leather steering wheel, front sports seats and Driving Experience Control switch with additional Sport+ mode. It features the BMW Navigation System Professional and full colour BMW Head-up Display which projects vital driving information into the driver’s line of sight. M Sport variant is also available in the new leather upholstery options with accents. The interior reflects the elegance of the new BMW 3 Series model range. The cockpit’s driver focus orientation is a signature BMW feature designed to provide optimum access to all important controls providing a sense of control and comfort. Seats in the new BMW 3 Series are electrically adjustable on both the driver and front seat passenger sides. The outstanding ergonomics have been improved further with carefully arranged chrome highlights, high-gloss surfaces and ambient lighting all of which build an even classier look. With the powerful BMW TwinPower Turbo diesel engine, the new BMW 320d remains sporty in every situation on the road. The combination of common rail direct injection and a turbocharger with variable turbine geometry ensures that the new BMW 320d delivers an excellent output of 140 kW / 190 hp. High torque of 400 Nm is available at just 1,750 – 2,500 rpm. The new BMW 320d accelerates to 100 km / hr in 7.2 seconds with the ability to achieve a top speed of 230 km / hr. The new eight-speed automatic transmission performs smooth, almost imperceptible gear shifts. At any time, in any gear, the transmission collaborates perfectly with the engine, enabling it to develop its full power and efficiency. The new BMW 3 Series Sport Line, Luxury Line and M Sport feature Shift Paddles for facilitating more convenient manual gear shifts. EfficientDynamics doubles the Sheer Driving Pleasure of the new BMW 3 Series with features such as Auto Start-Stop, ECO PRO mode, Brake-Energy Regeneration, Intelligent Lightweight Construction, Electronic Power Steering, 50:50 Weight Distribution and many other innovative technologies. Using the Driving Experience Control switch, the driver is able to choose between different driving modes to suit the driving conditions (ECO PRO, Comfort, Sport and Sport+). BMW has been setting the standard for connectivity between human, car and the outside world for many years now. The BMW ConnectedDrive includes BMW iDrive (the on-board Driver Information system), BMW Apps, Radio BMW Professional, Park Distance Control (PDC), Connectivity through Bluetooth and USB devices as a standard in the new BMW 3 Series. The BMW Navigation system Professional (integrated Global Positioning System-GPS), with an 8.8 inch high-resolution display is available in Sports Line, Luxury Line and M Sport.